You can compare a perio exam that you are currently viewing with any other exam that was recorded prior to the exam being viewed. From the Manage button menu, under Compare with, click (or tap) the perio exam that you want to compare with the exam that is currently being viewed. Tip: If there are no "Compare with" dates on the menu, there are no exams that have been recorded prior to the date of the exam that you are currently viewing. The chart changes to the comparison view. For the PD, GM, and CAL measurements, a number in a gray box indicates that there was no change; a number in a pink box indicates that there was an increase; and a number in a green box indicates that there was a decrease. On the line graph for PD, GM, and CAL, a solid line represents the readings from the currently selected exam (as indicated in the exam list); a dashed line represents the readings from the older perio exam (as indicated in the blue box near the top). 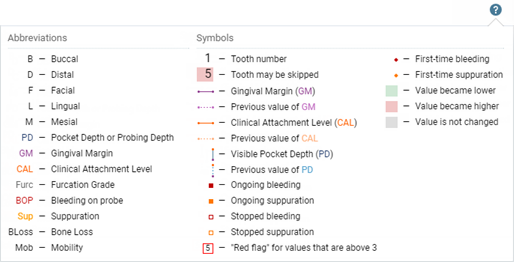 To view an explanation of all the abbreviations and symbols that are used for perio exam comparisons, click (or tap) the Legend button . 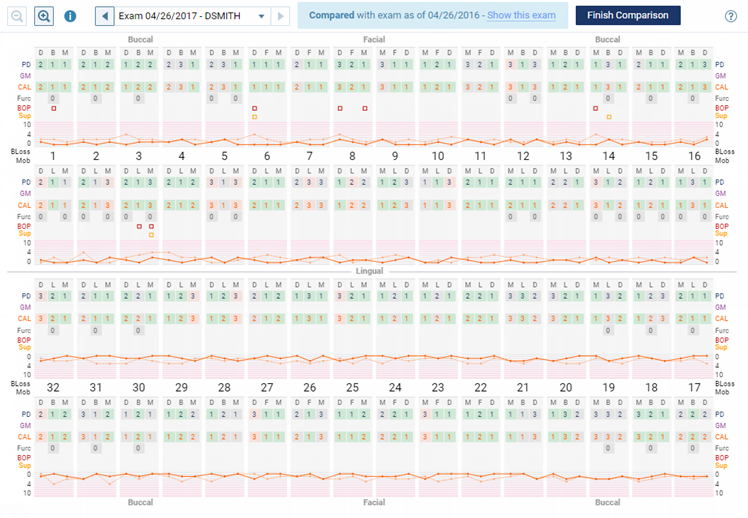 To change which exam is being compared (as indicated in the blue box near the top) to the one selected (as indicated in the exam list), select a different exam (if more than one older exam exists) under Compare with on the Manage button menu. To view the exam being compared, in the blue box near the top, click (or tap) the Show this exam link. To return to the comparison view, click (or tap) the Back to comparison link. To zoom in and out, click (or tap) the Zoom In and Zoom Out buttons. To exit the comparison view of the chart, click (or tap) Finish Comparison.